“We didn’t mind about this radical change of direction and style,” the narrator states near the beginning of Nocilla Lab. “You should be able to be an abstract artist one week, and a figurative or a pop artist the next.” Published as the last (though also standalone) instalment in the Nocilla Trilogy, Nocilla Lab by Agustín Fernández Mallo is committed to that idea: there is no need to squeeze one story into the confinements of one form or genre when changing styles and directions can expand its meaning. Nocilla Lab is a thrilling avant-garde work that moves from reflective to humorous to surreal, from non-fiction to fiction, from horror story to graphic novel, moulding it all together to create a brilliant exploration of our lives and relationships in the contemporary world. Nocilla Lab begins as an eighty-page stream-of-ideas sentence, though reading it is much less daunting than it sounds. Thomas Bunstead’s translation flows very well and the single-sentence format is justified by the story. The first-person narrator, who appears to be travelling the world with his girlfriend in preparation for a mysterious Project, goes back and forth between ideas, observations and events, between the past and present, adding new layers of meaning every time he returns to a previous thought. Connections are made between the most unexpected objects, concepts and bits of dialogue, repeated throughout the story: Coca-Cola, with its unprecedented resemblance to “nothing but itself”; silence; The Music of Chance by Paul Auster; CCTV cameras; “pass me the igniter.” Everything is connected, and everything impacts our lives in ways we might not consciously realise. Like in a lab, Mallo takes the random ingredients and mixes them into one multi-layered narrative. The sentence ends but the narrative picks up as a much more chronological collection of bite-sized pieces. The protagonists (one of which is called Agustín Fernández Mallo) arrive at an old, secluded penitentiary converted into an ecotourism place, where the story gradually turns more unsettling and surreal. They meet the hotel owner, whose behaviour becomes increasingly erratic; they discover bizarre places, like a garden made entirely out of dust-covered plastic; days blend into one. The stream-of-consciousness and the thriller story form the first two parts of the book, called “Automatic Search Engine” and “Automatic Engine” – then the book moves on to “Engine Fragments,” consisting of unnumbered pages full of brief notes, yet again continuing the story from a different perspective; and finishes with a graphic narrative, where a cartoon character recognisable as Mallo meets Spanish author Enrique Vila-Matas. Blending different genres and forms of expression into a captivating multi-layered story, Nocilla Lab is not just an interesting literary experiment but also an exquisite work that stays with the reader for a long time. 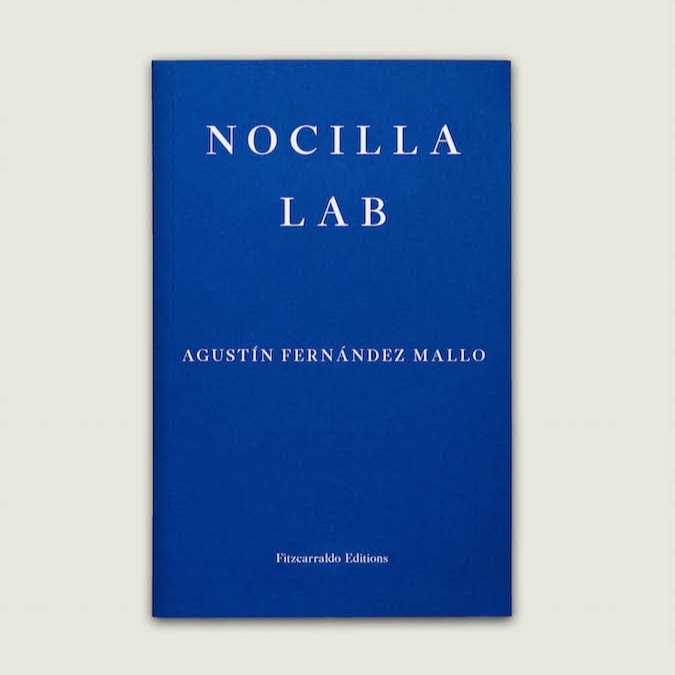 Nocilla Lab by Agustín Fernández Mallo is translated by Thomas Bunstead and published by Fitzcarraldo Editions on 16 January. The first two instalments of the trilogy, Nocilla Dream and Nocilla Experience, are also available by Fitzcarraldo.